I’m turning into a JetBlue fanboy and I’m not ashamed to admit it. I’ve flown the carrier’s Mint class product on a transcon route before and was really impressed — so much so that I couldn’t wait to fly it again on my next trip across the country. When I knew I had to go to San Francisco for business, the first option that came to mind was Mint, so I went ahead and booked the seat. I was curious, as always, to see if this experience would be as good as my previous flights with the carrier — if it was anywhere near as enjoyable, I’d be a happy flyer. Needless to say, I wasn’t disappointed. My reservation from JFK to SFO in Mint. I booked the flight in Mint for a total of $853 and paid with my Chase Sapphire Preferred card to get 2x the points on travel. Unfortunately, the new JetBlue cards weren’t available at the time but I’m looking forward to getting my JetBlue Plus Card soon. Had I booked the flight using this card, I would have earned 6 points per dollar for a total of 5,118 TrueBlue points (giving me a return of $72 since I value TrueBlue points at up to 1.4 cents each), plus the points I earned from JetBlue for the flight. It’s worth mentioning how great one-way Mint pricing is, too, compared with other transcon options out there. A one-way flight from New York (JFK) to San Francisco (SFO) in JetBlue Mint starts at $599 in March and April, while a one-way business class fare on American Airlines starts at $1,421 in March ($1,018 in April). For a round-trip flight between JFK and SFO in March or April, you’re looking at $1,197 in Mint and the same price in AA business class. At the time of booking, I saw a map of the aircraft and available seats in the Mint cabin and was so excited to see that there was a seat in row 2 available. My biggest tip when booking Mint is making sure you get rows 2 or 4 because you get your own private individual area. Choose row 2 or 4 in Mint for your own suite. The regular Mint seats in rows 1, 3 and 5 will give you 58 inches of pitch (80 inches when reclined to the full lie-flat bed) and are 20.5 inches wide. However, with the private space in rows 2 and 4, not only will you have the privacy of a closing door, but you’ll also have a bit more room to stretch out. The individual spaces give you 60 inches of pitch (80 inches when reclined to the full lie-flat bed) and are 22 inches wide. In my opinion, these private suites in Mint’s rows 2 and 4 are the nicest way to fly across the country — barring the American Airlines 777-300ER that only flies between Miami and Los Angeles or random one-offs. As for daily scheduled service, Mint is hard to beat. 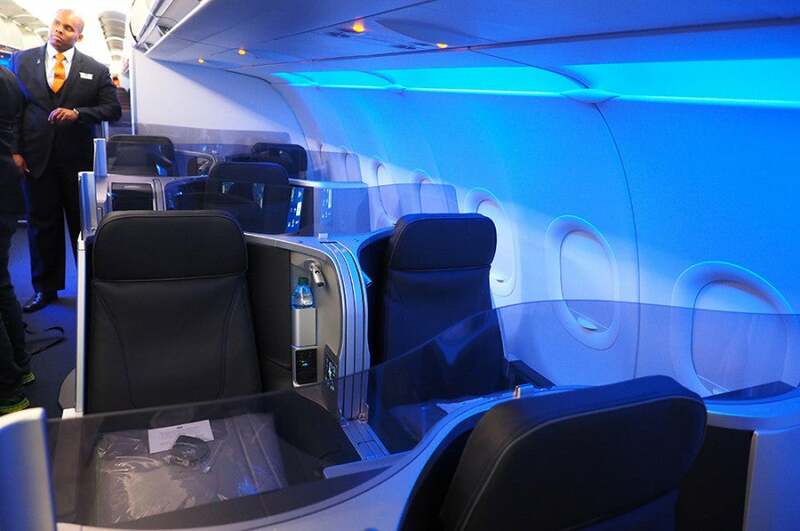 JetBlue’s Mint service is expanding. 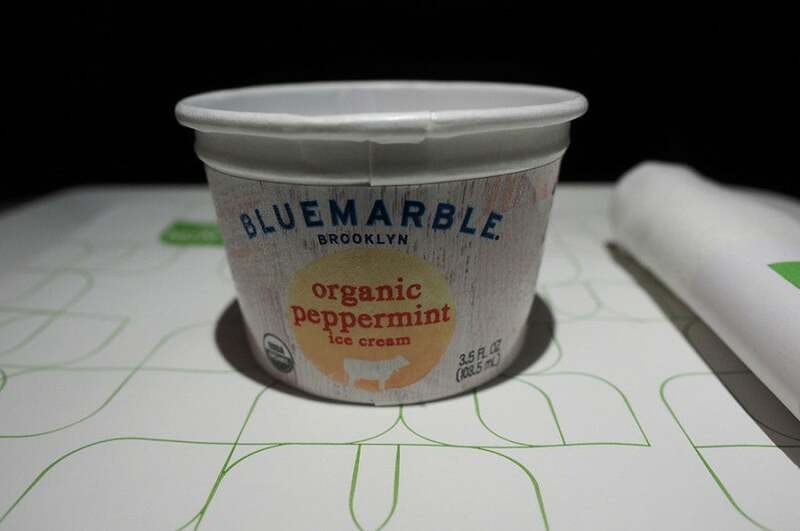 Unfortunately, Mint isn’t offered on that many flights in JetBlue’s route network. You can currently fly Mint on daily, year-round service between JFK and Los Angeles (LAX) and San Francisco (SFO). You can also fly Mint from JFK on seasonal Saturday service to Aruba (AUA) through April 30, 2016, and to Barbados (BGI) on year-round Saturday service — both routes also had daily service between December 19, 2015, and January 4, 2016. JetBlue is also launching Mint service between Boston (BOS) and SFO (starting March 24), LAX (starting October 20) and BGI (seasonal Saturday service starting March 26). 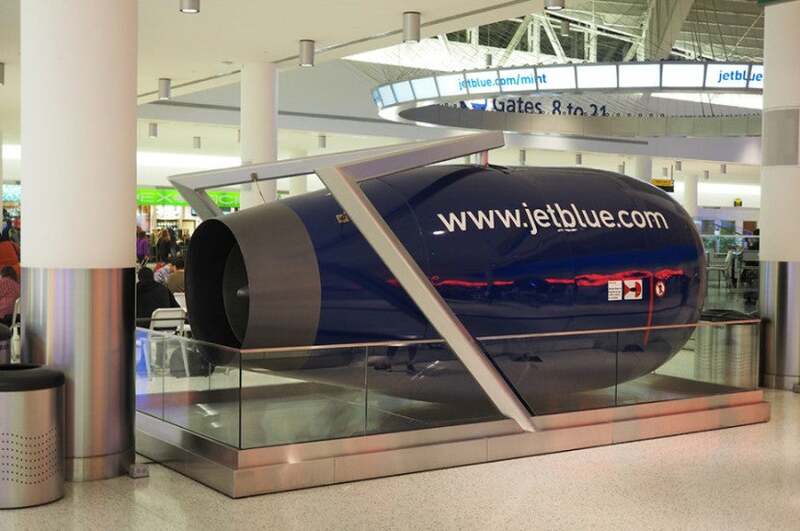 In addition, JetBlue is changing the game with its low fares and this premium product. Even if you don’t fly JetBlue, you should thank the carrier because it’s really keeping fares in check on these routes — we like to call this The Mint Effect. The highest level in JetBlue’s True Blue rewards program is Mosaic. You can get Mosaic status by flying 30 segments plus 12,000 base flight points within a calendar year or 15,000 base flight points within a calendar year. 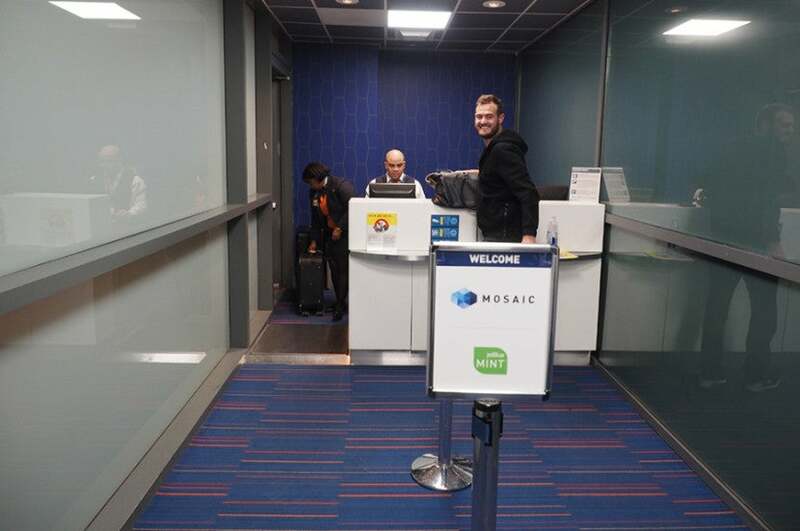 With Mosaic status, you’ll get fee-waived checked bags, bonus points and early boarding, among other benefits. You can book this route for 45,300 points + $5.60 in taxes and fees from JetBlue’s website. You can also look into getting one of JetBlue’s new credit cards, which are a great way to earn status. Be sure to check-in at the specified Mint counter at JFK. 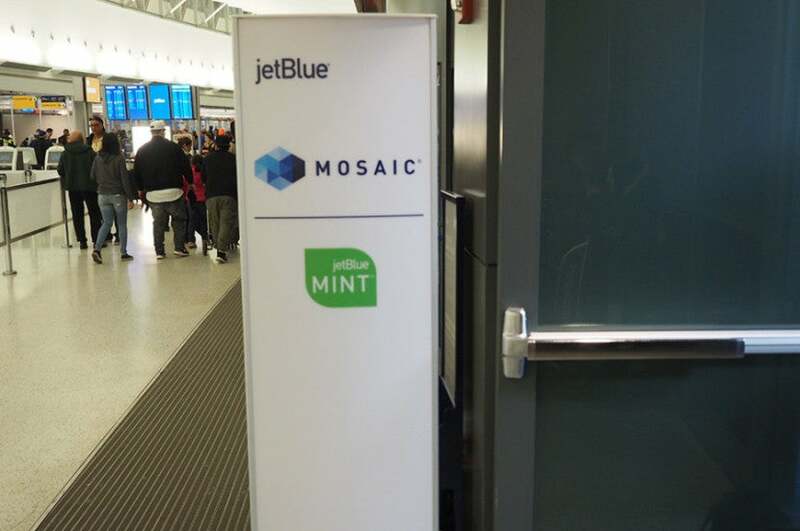 When I arrived at JFK, I headed for the designated Mint and JetBlue Mosaic check-in area. 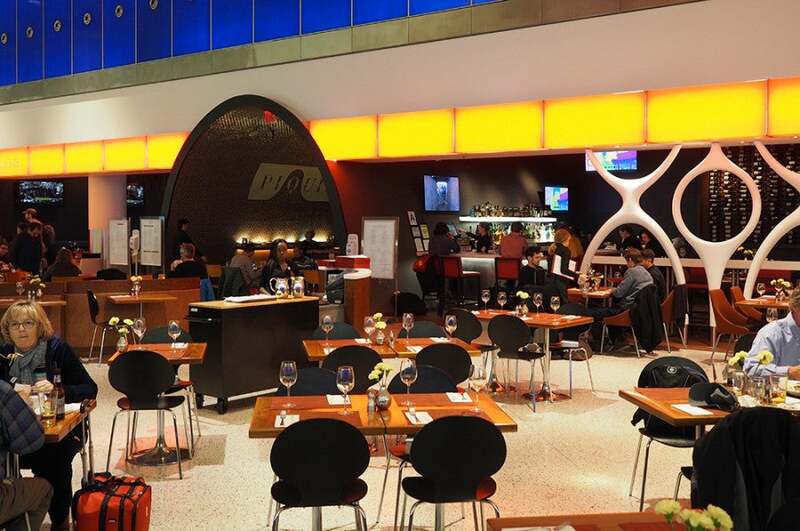 Note that the check-in area for Mint and Mosaic passengers is not at the main counter, but it’s a bit hidden. When you enter through JFK’s Terminal 5 doors, the small room-like hallway is to the left. The entrance to the Mint/Mosaic check-in area. Don’t forget to check in at this counter when you arrive at the airport. It’s a much faster process and I was in and out within a couple of minutes. From there, I headed for security, which was a breeze thanks to TSA PreCheck. The regular security lines at JFK are usually consistently really long so for that reason alone, make sure you have TSA PreCheck. Unfortunately, there’s no lounge access that comes with Mint. However, if you have a Platinum Card from American Express, you’ll have access to the Airspace Lounge. Even though I was able to get in, I didn’t bother this time because I was running late and made a quick run to Jamba Juice in the main terminal — a good choice. I decided to stay in the main terminal rather than go to the Airspace Lounge. From there, I headed for the gate and boarded the plane early. The boarding process went smoothly — nothing of note. In Mint, there are two rows with two suites and three rows with four seats. The Mint cabin is very nice and pretty comfortable. It’s composed of four private suites (in rows 2 and 4) and 12 regular lie-flat beds in a 2-2 configuration (rows 1, 3 and 5). My private suite in row 2. My private suite seat was kind of like Delta’s lie-flat on its 767s. It’s not the most spacious seat and my legs were kind of cramped, but in general, I was able to sleep on the plane. I was able to get some sleep in my private suite — even though it was a bit tight. On just about every other carrier for the most part, you’re going to be sitting next to someone else in business class on a transcon flight. But with these private suites, you really get the chance to be alone and enjoy your time and space on a long flight, which, if you’re a recluse like me, is awesome. The nice food menu and a note from the great flight attendants. Besides the private suite, which is an obvious favorite part of Mint, the other aspect where I think Mint really sets itself apart is with the food. I flew on a United p.s. transcon and the food was terrible (though there have been some recent improvements). And I’ve also flown with American on the same route and the food is often not good. Each time I’ve flown Mint, I’ve been consistently impressed with the food — it really is excellent. The Saxon + Parole menu gives you five tapas options to choose from and you get to select three. 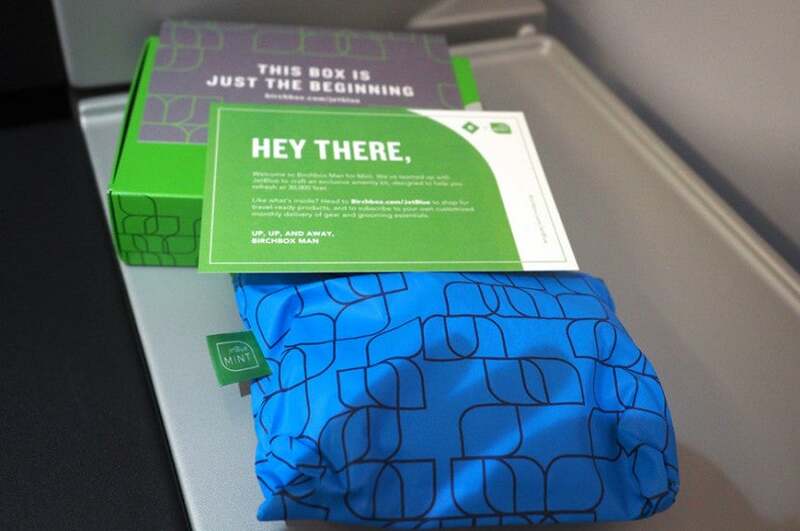 The menu changes every month, offering flyers something new and fresh whenever they fly Mint. 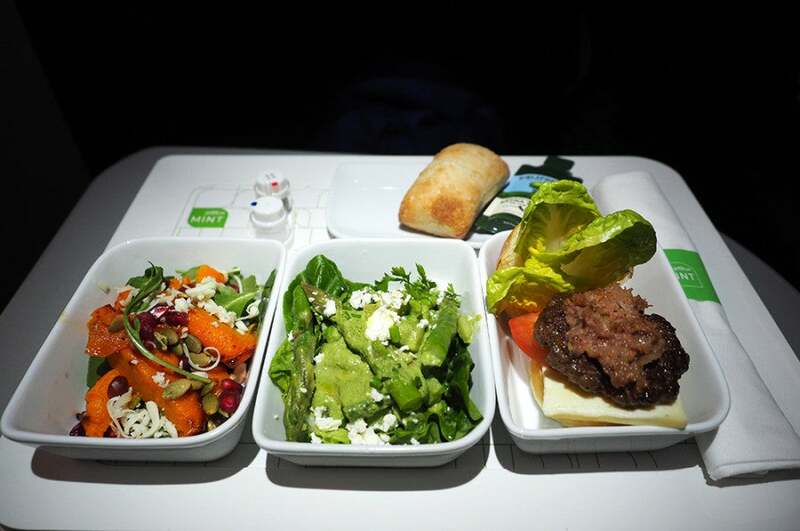 On this flight, I chose the roasted butternut squash salad, the green goddess salad and the black angus burger. Each of them were fantastic — like I said, I was really impressed. Great peppermint ice cream for dessert. Each meal I’ve had when flying Mint has been delicious. It’s actually food you want to eat, not just an indiscernible chicken breast with creamy-type sauces like you so often get on other carriers. The Mint experience is like no other domestic transcon product — and that includes the crew. The crew on board were really friendly and that can either make or break an experience. So when the Mint crew members were great, it furthered my thought that everything on Mint is just flawless. 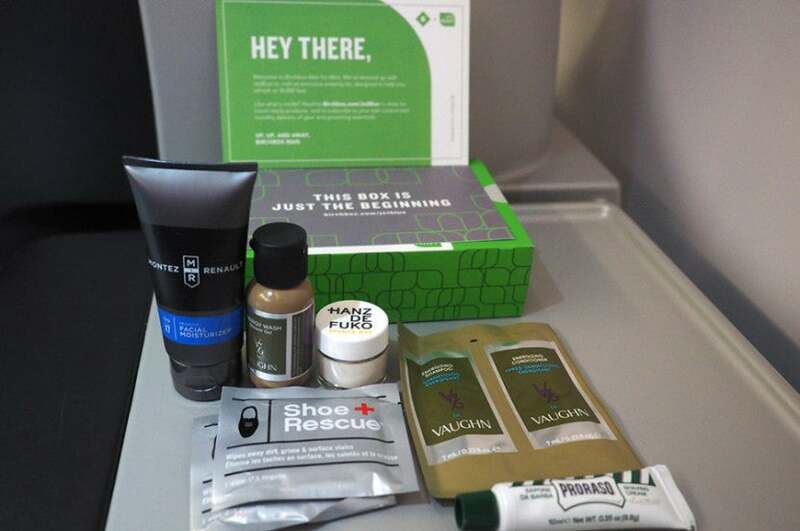 During the flight, I was given Mint’s Birchbox amenity kit, which was very impressive. It’s really one of the better kits I’ve seen — especially on a domestic carrier. I was very impressed with the contents of my amenity kit. It included a bunch of products that you normally wouldn’t find in your average amenity kit. Things like shoe rescue, shaving cream and a large tube of facial moisturizer. The contents inside are not only your basics, but they’re unique products in larger-than-average sizes. 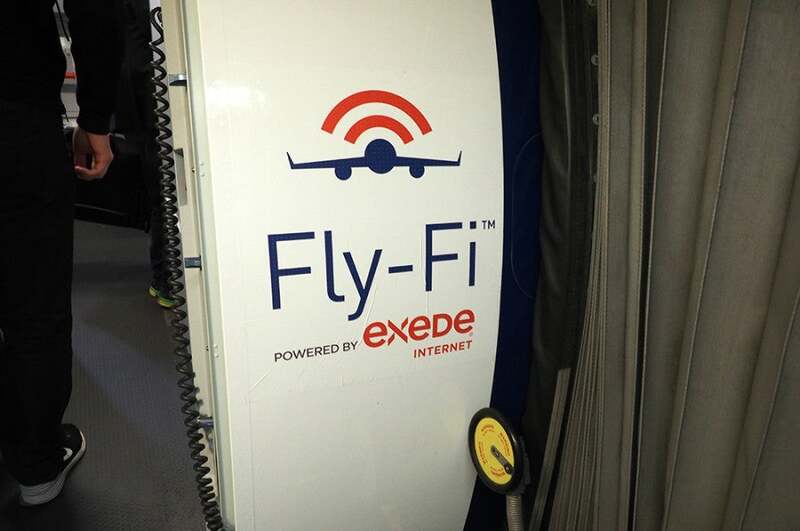 JetBlue’s free Fly-Fi is an added bonus — but a bit spotty. My one complaint — albeit small — was the Wi-Fi. JetBlue’s Wi-Fi, Fly-Fi, which is free to all passengers, can sometimes be really slow and it somewhat annoyed me at times because I couldn’t even upload Snapchat videos. But in general, I was able to get more sleep because of it, so it really wasn’t that big of a deal to me. You can also pay for faster connectivity, but at $9 per hour that can get really expensive. That being said, the in-flight entertainment system in Mint is still unbeatable. On each seat-back, there is a 15-inch screen that offers satellite radio, live TV and more. I love being able to catch up on my favorite shows while I’m in the comfort of my own lie-flat bed and it makes me feel like I’m in my own private theater. Overall, I have to say I’m consistently impressed with JetBlue’s Mint product. Each time I’ve flown, I’ve enjoyed everything from the service to the private suite and the in-flight entertainment. If every domestic airline’s transcon service was this great, I might fly transcon more just for the experience. I recently flew JetBlue (not Mint) to Costa Rica in an Even More Space seat and it was super comfortable — even for a coach seat — so stay tuned for more on that. Am I turning into a JetBlue fanboy? I think so. 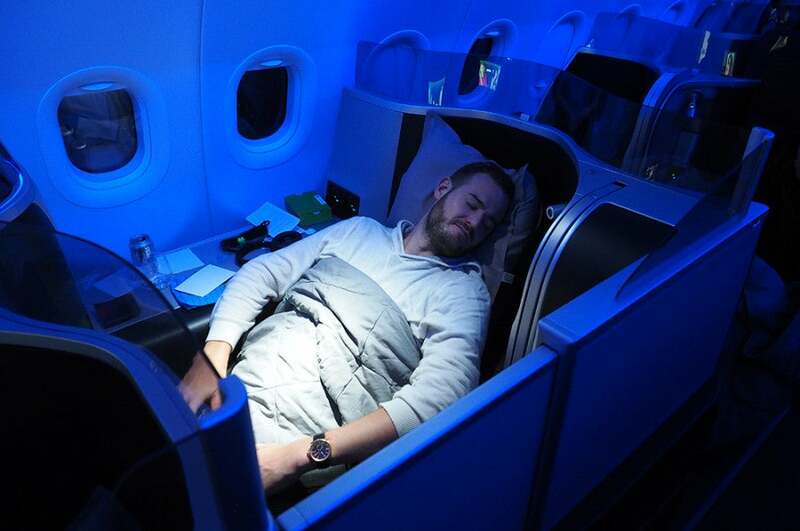 I just hope that JetBlue expands its Mint class to even more routes so there are plenty of opportunities to fly in one of the best cabins in the skies. 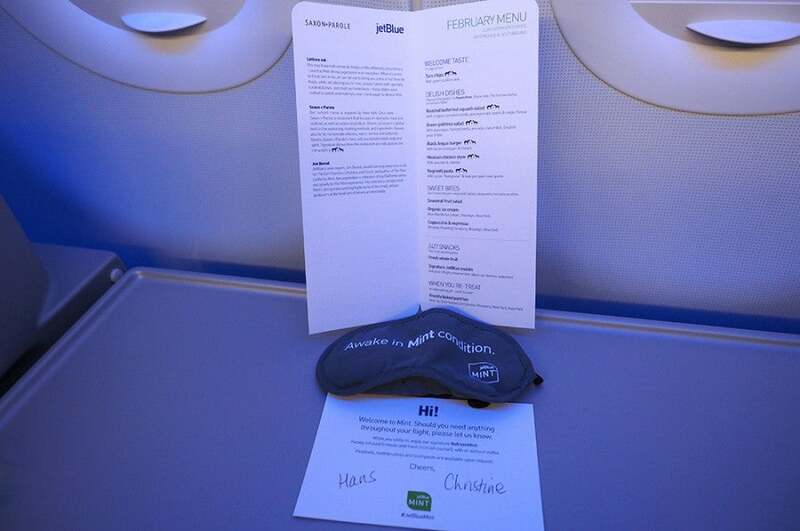 Have you flown JetBlue’s Mint class? Are you as big of a fan as I am?